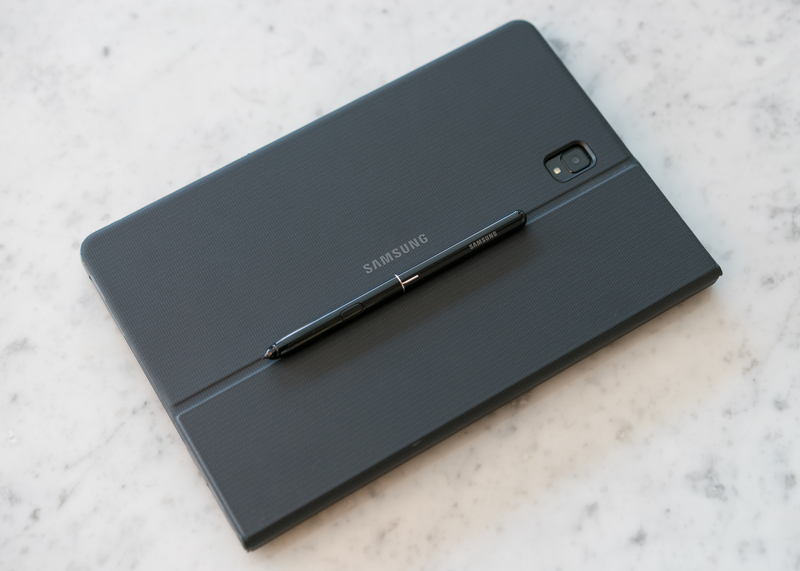 You are at:Home»Android»Samsung Galaxy Tab S4 Review: Are Tablets Really Dead? Samsung Galaxy Tab S4 Review: Are Tablets Really Dead? With smartphone screens getting larger and more powerful, the desire for tablets seems to have been in sharp decline. The only serious players still producing tablets are Apple, Huawei and Samsung. This time round it’s the latter of the three big hitters whose tablet offering we have been living with. Does the Samsung Galaxy Tab S4 have what it takes to beat the trend of decline? Here are my thoughts. Very little has change in tablet design over the past couple of years, the form factor is what it is. But it seems around 10-inches is the sweet spot. The new Tab S4 does offer reduced bezels though, following the removal of the physical home button and Samsung logo. Without notably increasing its footprint, the Tab S4 manages to offer a WQXGA 2560 x 1600 resolution screen that’s almost an inch larger than the 9.7-inch 2048 x 1536 HDR Super AMOLED display of the Tab S3. I like the understated look of the Tab S4 and its Gorilla Glass 3 back and brushed metal frame gives it a premium feel. Everything from video to text and web pages look rich and sharp on this tablet’s 287 ppi display. In fact it’s so good, I’ve taken to using it to show off my portfolio and showreels when I have meetings with potential clients. As a creative professional, I need to be able to demonstrate my work and abilities in the best way possible. The Tab S4’s fantastic display, as well as the flexibility to connect it to a second, larger monitor or tv and run it in dual display mode – either via DeX or HDMI cable – allows me to do this. One of my biggest issues with tablets is that while they’re designed to be the ultimate mobile productivity or travel entertainment tools, they often don’t have the endurance to back it up. 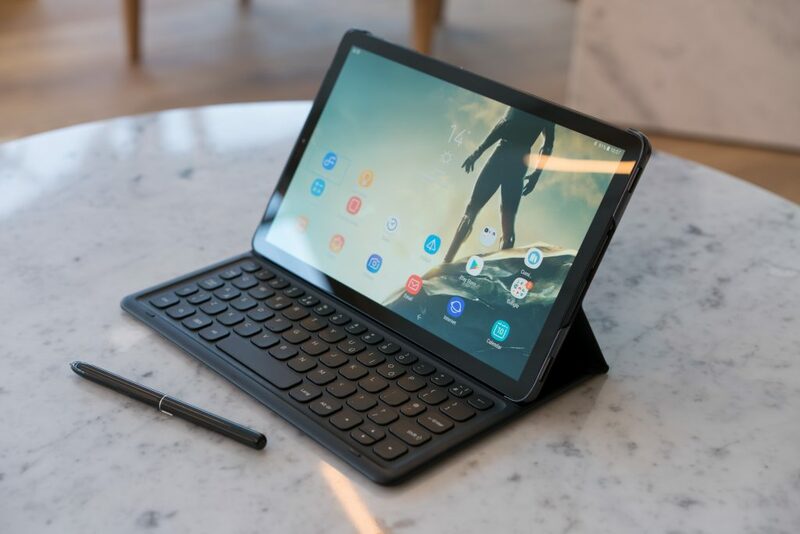 In the case of the Samsung Galaxy Tab S4, this gadget aims to fill both of those demands, making ideal for someone like me if its battery performance can keep up. Having lived with the Tab S4 since launch I’m happy to confirm that its large 7,300mAh battery doesn’t fall too short of its manufacturer stated claims of proving “all-day performance”. If I take the tablet out with me for a day of meetings and coffee shop working, I don’t find myself needing to look for the plug socket at every stop. I can comfortably get about 9.5 hours of use before my battery is dangerously low, by which time, I’m usually back home. In aeroplane mode, watching videos alone, Samsung claims you can get about 16 hours of use and although I haven’t yet been on a flight long enough to fully test that, I’m very happy with its performance. The Tab S4 outperforms both its predecessor and much of its closest competition, save for the iPad Pro which has a larger capacity battery and a lower resolution screen. There were a couple of red flags for me when the Tab S4 was announced, firstly the price. There’s no getting away from it. When the tablet market has been as tough as it is, pricing a tablet at £599 (Wi-Fi) or £649.99 (4G) is a big ask for a lot of consumers. Then you have its specs that for the price tag, you’d be forgiven for expecting much more. 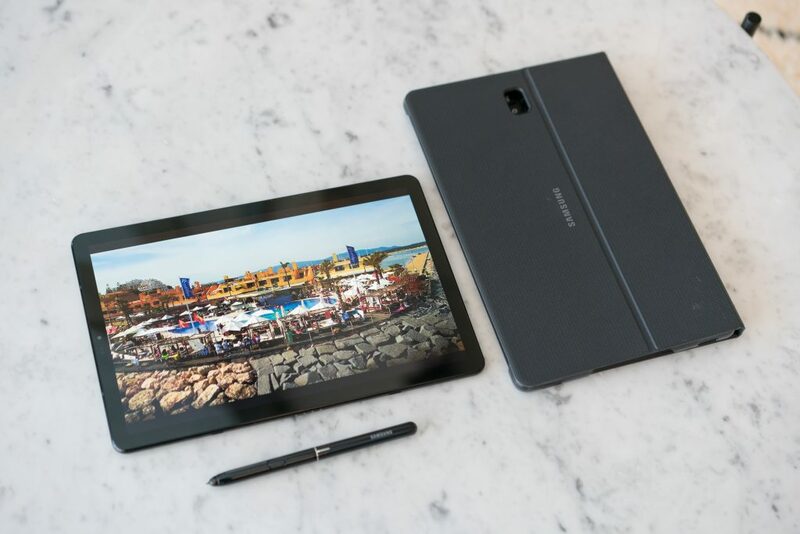 The Samsung Galaxy Tab S4 runs an old Snapdragon 835 chipset and packs only 4GB of RAM and 64GB of onboard storage (although it can be expanded via microSD). There are more affordable devices that offer similar internal specs or better on paper. However, in use the 4GB RAM at its disposal does deliver a largely seamless productivity and entertainment experience. It’s only when trying to make the most of the Tab S4’a USP’s and extras that you notice it struggling under the load. For example, using DeX, connecting can occasionally be hit and miss and I noticed the responsiveness of the tablet’s screen seemed to drop while in this mode. Also, app features like Samsung Flow, which aims to bridge the gap between devices, absolutely refused to pair with my Galaxy S9 on repeated attempts. At first it wouldn’t pair via Bluetooth because I was connected to Wi-Fi. Then without Wi-Fi on it refused to register despite being more than happy to securely pair with my Galaxy S9, I eventually gave up. I’ll be bringing this up with a Samsung rep and trying to trouble shoot this issue. A third gripe is the fact that you have to throw in another £100+ for the keyboard book cover. It’s essential if you want to make the most of the Tab S4. I absolutely love the keyboard cover too. It offers large enough keys with good travel to make it highly usable for writing on-the-go. So much so that it’s replaced my laptop for long commutes out of office days and working trips. As the fingerprint scanner was ditched to allow for more screen space, the Galaxy Tab S4 utilises iris/face scanning for its additional security via its 8MP front-facing camera. I found these easy to set up and reliable to use. While we’re on cameras, the Galaxy Tab S4’s main camera is a 13MP unit with an f1.9 aperture lens. The main camera can record 4K video, while the smaller selfie camera can record video in up to 1080p. But with that said, don’t be that person who takes pictures or records video in public with a tablet held up in front of you or above your head at concerts. Sure, I experienced some niggles with its connectivity/enterprise feature. 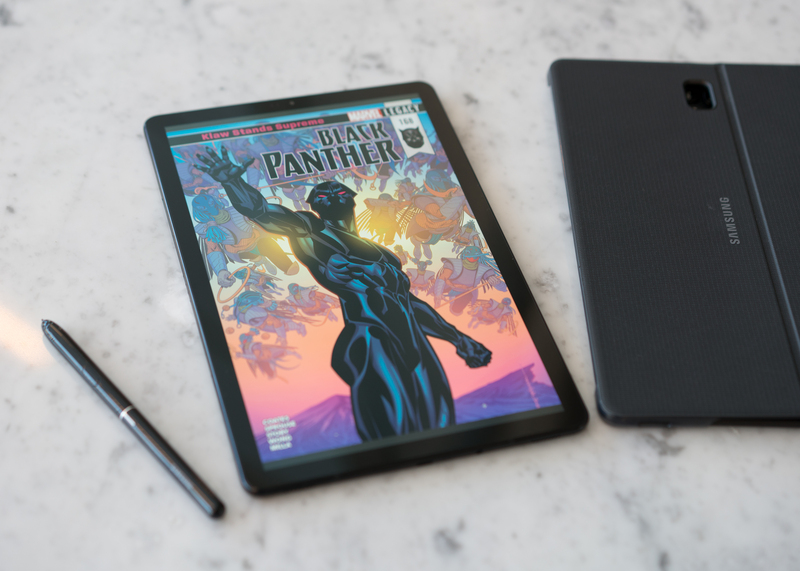 The Samsung Galaxy Tab S4’s fantastic screen and quad speakers with Dolby Atmos x AKG powered “surround sound” speakers make it ideal for entertainment. While its keyboard, S-Pen and PC-like DeX experience (when it works) make it a wonderful productivity tool. Are tablets dead? 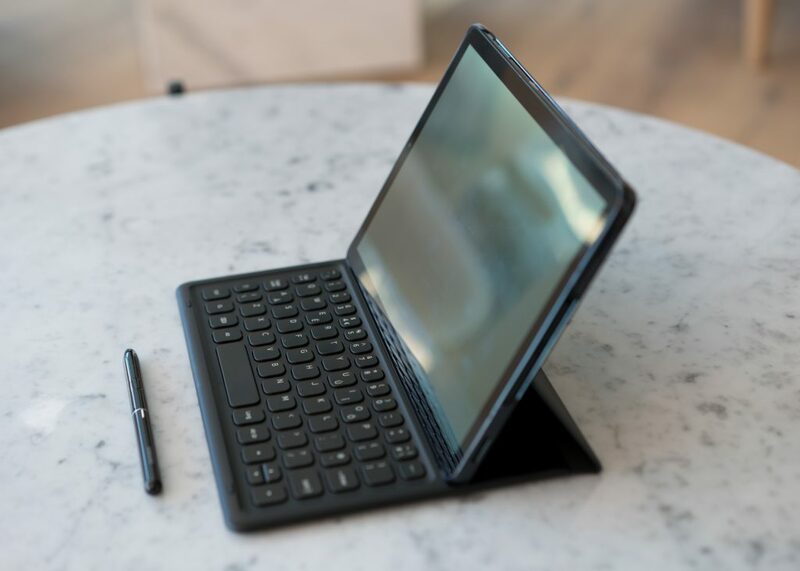 If the Galaxy Tab S4 is on your consideration list, most definitely not. It sits perfectly in the slot between smartphone and desktop computer or laptop. Laptops these days tend to be most people’s desktop computer of choice anyway. But this tablet is much more portable and delivers great battery performance that will keep you entertained and productive all day if you’re on the move. And when you’re at your desk, it’s a great companion device for monitoring social media or news.